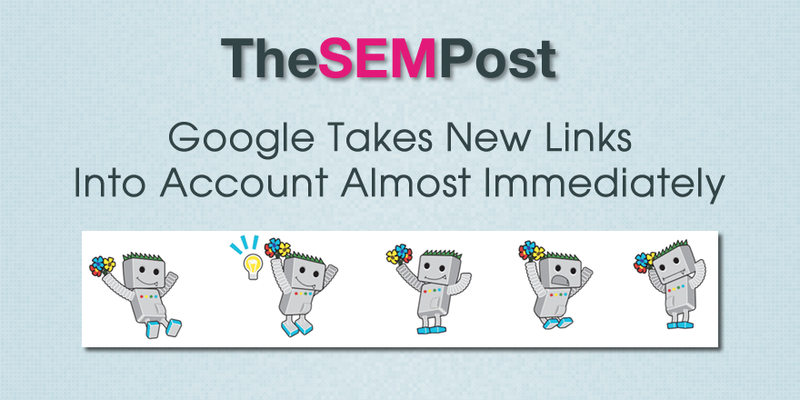 How quickly will Google take a brand new link into account once it is crawled by Google? According to Google, it is almost immediately…. or as immediate as it takes for Google to crawl and discover that new link. The question came up in the last Google Webmaster Office Hours with John Mueller, specifically how quickly Google will take into account when a site earns one of those really great links and how quickly the rankings will improve from it. I can’t give you a definitive answer for that, but as far as I know, that’s almost immediate. So when we see that link, when we notice that there’s something new on those pages, pointing to a URL we know about, or that we don’t know about, then we generally pick that up almost immediately. So this is something you can kind of see when it is a really new business or a new website, you see that jump from being indexed to not being indexed due to a link like that [editor note: he seems to have misspoke missing up the “indexed” and “not being indexed”] fairly quickly and we try to pick that up as quickly as possible because sometimes there’s effects that are very time sensitive that we need to reflect in our search results as well. When everyone is talking about this business that is doing something really fantastic, then we need to know about that and we need to take that into account when it comes to rankings. So as Mueller said, there are a few caveats, like Google must crawl the newly earned link first and it must be a URL Google already knows about as the destination link, otherwise there could be a slight more of a delay if Google needs to also discover and crawl that linked URL too. But if you get those great powerhouse links, you should be able to see the results in the rankings very quickly. Yes it Looks like as Google crawls immediatelyafter announcing the URL. But I added some page containing structured data and now for one week I can not see any results in my Dashboard..
That report in Google Search Console is quite behind. Check the search results, as it might be showing in the search results but not yet in the structured data report.